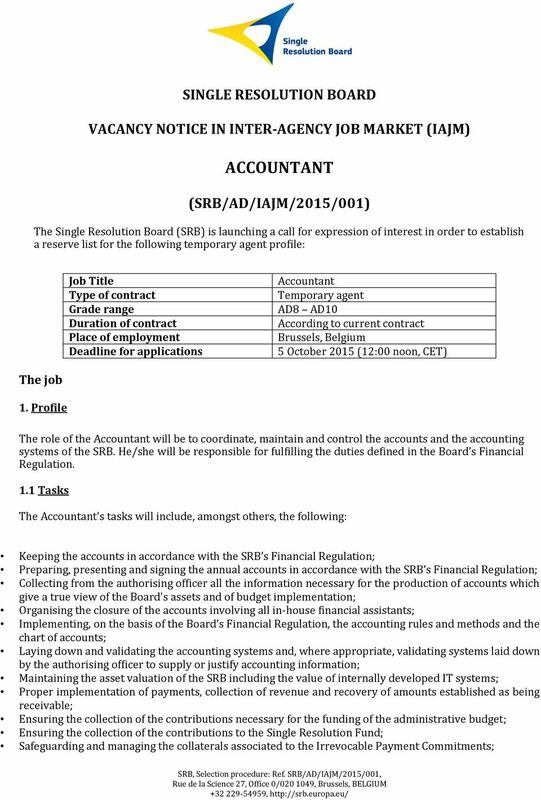 Download "SINGLE RESOLUTION BOARD VACANCY NOTICE IN INTER-AGENCY JOB MARKET (IAJM) ACCOUNTANT (SRB/AD/IAJM/2015/001)"
2 Liaising with the entity responsible for the investments of the Fund; Treasury management; including the Board s cash-flow monitoring, liquidity planning and management of the SRB s cash reserves, both the administrative budget and for the Fund; Treasury management; including the Board s cash-flow monitoring, liquidity planning and management of the SRB s cash reserves, both for the administrative budget and for the Fund; Participating in systems development projects linked to automated fee invoicing and validation of such systems; Leading the accounting team, being responsible for organising the accounting work, distributing tasks, and ensuring that they are performed in accordance with the required standards; Coaching, advising and managing assigned staff - including the annual performance cycle - training and motivating of staff; Providing recommendations to the SRB management in the field of expertise; Acting as a policy expert, keeping knowledge of trends and developments up-to-date, developing and implementing internal policies, systems, procedures and guidelines; Carrying out any other duties required in the interests of the service. Qualifications and experience required 2. 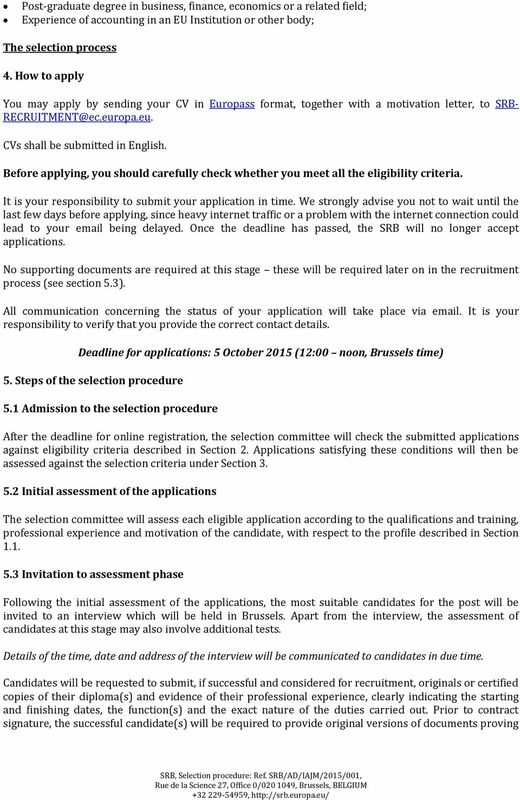 Eligibility criteria 2.1 General conditions By the closing date of this call candidates must: be employed as Temporary Agent in one of the EU Agencies, at the grade range AD8-AD10 be nationals of a Member State of the European Union; be able to serve a full 3-year term before reaching the retirement age of 65; enjoy their full rights as citizens; have fulfilled any obligations imposed by national laws concerning military service; meet the character requirements for the duties involved; be physically fit to perform their duties Education Candidates are required to have: A level of education that corresponds to completed university studies of at least 3 years attested by a diploma together with an additional year of relevant professional experience; OR A level of education that corresponds to completed university studies of at least 4 years attested by a diploma. Only qualifications issued by EU Member State authorities and qualifications recognised as equivalent by the relevant EU Member State authorities will be accepted. At least one of the university studies mentioned above must be in a field relevant to the position. 1 Before taking up his/her duties, the successful candidate will undergo a medical examination by one of the institutions medical officers, if not undergone before. 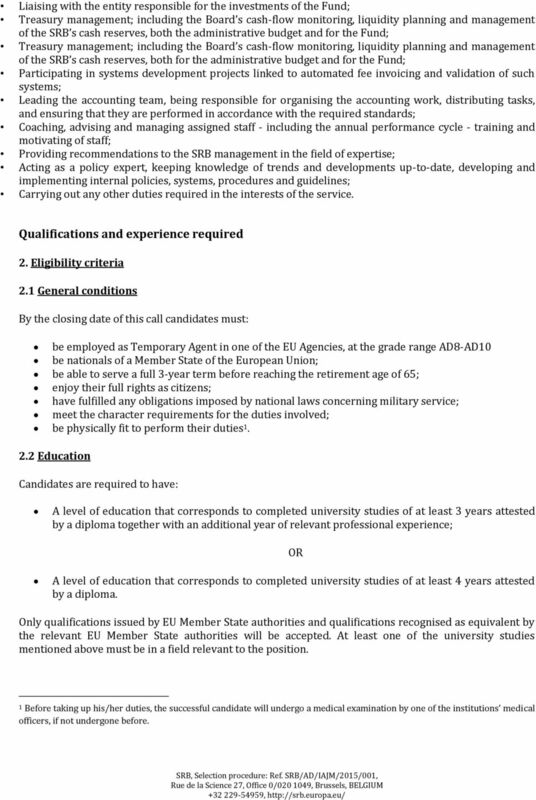 3 2.3 Experience Candidates must have, at the closing date for applications, professional experience of at least 9 years 2 (in addition to the 1 year mentioned under 'Education') in a field relevant to this position. Out of the nine (9) years of professional experience mentioned above, at least five (5) years of proven professional experience must be in some or all of the fields linked to the tasks described in section 1 above. Work experience, periods of further training, study or research in the field of economics undertaken since obtaining the degree required under point 2.2 will be taken into account for the calculation of the total length of professional experience. 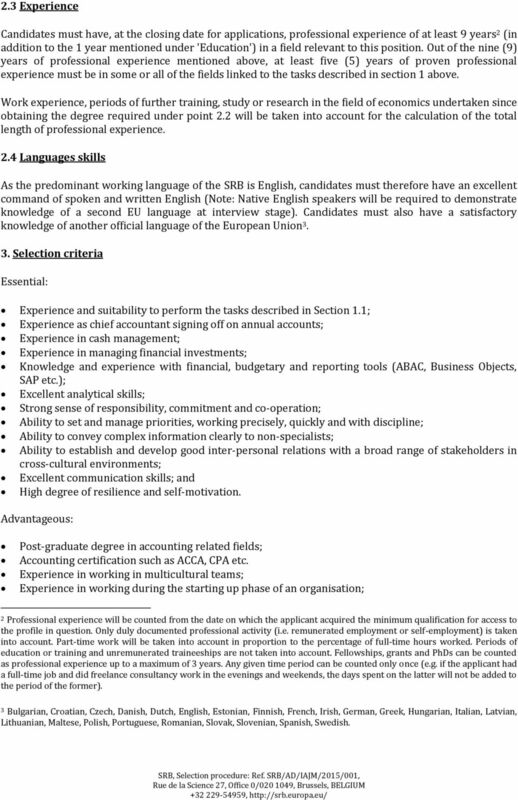 2.4 Languages skills As the predominant working language of the SRB is English, candidates must therefore have an excellent command of spoken and written English (Note: Native English speakers will be required to demonstrate knowledge of a second EU language at interview stage). Candidates must also have a satisfactory knowledge of another official language of the European Union Selection criteria Essential: Experience and suitability to perform the tasks described in Section 1.1; Experience as chief accountant signing off on annual accounts; Experience in cash management; Experience in managing financial investments; Knowledge and experience with financial, budgetary and reporting tools (ABAC, Business Objects, SAP etc. ); Excellent analytical skills; Strong sense of responsibility, commitment and co-operation; Ability to set and manage priorities, working precisely, quickly and with discipline; Ability to convey complex information clearly to non-specialists; Ability to establish and develop good inter-personal relations with a broad range of stakeholders in cross-cultural environments; Excellent communication skills; and High degree of resilience and self-motivation. Advantageous: Post-graduate degree in accounting related fields; Accounting certification such as ACCA, CPA etc. Experience in working in multicultural teams; Experience in working during the starting up phase of an organisation; 2 Professional experience will be counted from the date on which the applicant acquired the minimum qualification for access to the profile in question. Only duly documented professional activity (i.e. remunerated employment or self-employment) is taken into account. Part-time work will be taken into account in proportion to the percentage of full-time hours worked. Periods of education or training and unremunerated traineeships are not taken into account. Fellowships, grants and PhDs can be counted as professional experience up to a maximum of 3 years. Any given time period can be counted only once (e.g. if the applicant had a full-time job and did freelance consultancy work in the evenings and weekends, the days spent on the latter will not be added to the period of the former). 3 Bulgarian, Croatian, Czech, Danish, Dutch, English, Estonian, Finnish, French, Irish, German, Greek, Hungarian, Italian, Latvian, Lithuanian, Maltese, Polish, Portuguese, Romanian, Slovak, Slovenian, Spanish, Swedish. 5 the eligibility criteria. 5.4 The assessment phase An interview and any other test(s) with the selection committee will enable it to carry out an assessment of the candidate according to the selection criteria described in Section 3. The assessment phase will be conducted in English. 5.5 Verification of documents and scrutiny The candidates' application will be checked against supporting documents provided in order to confirm the accuracy and eligibility of the application. If, at any stage in the procedure, it is established that the information in an application has been knowingly falsified, the candidate will be disqualified from the selection process. You will also be disqualified if you: do not meet all the eligibility criteria; do not provide all the required supporting documents. 5.6 Reserve list The selection committee will place the most suitable eligible candidates on a draft reserve list. This draft will be submitted to the Chair of the SRB for approval. The adopted reserve list will be valid until 31 December Reserve lists may be extended by decision of the SRB. 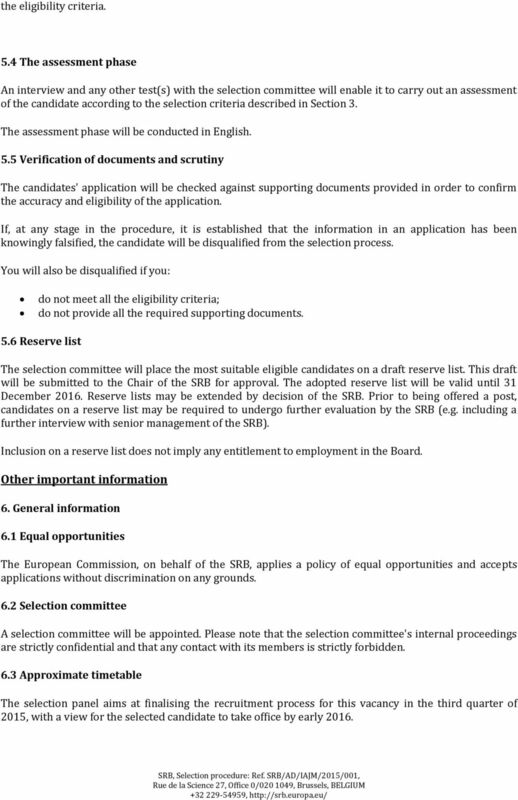 Prior to being offered a post, candidates on a reserve list may be required to undergo further evaluation by the SRB (e.g. including a further interview with senior management of the SRB). Inclusion on a reserve list does not imply any entitlement to employment in the Board. Other important information 6. General information 6.1 Equal opportunities The European Commission, on behalf of the SRB, applies a policy of equal opportunities and accepts applications without discrimination on any grounds. 6.2 Selection committee A selection committee will be appointed. Please note that the selection committee's internal proceedings are strictly confidential and that any contact with its members is strictly forbidden. 6.3 Approximate timetable The selection panel aims at finalising the recruitment process for this vacancy in the third quarter of 2015, with a view for the selected candidate to take office by early 2016. 6 6.4 Recruitment conditions / Career The successful candidate may be offered a contract as a temporary agent, in accordance with the conditions of employment of other servants of the European Communities, with the same duration as currently applicable by his/her employer provided all eligibility criteria are met. The place of employment is Brussels (Belgium), where the SRB is based. 6.5 Remuneration Successful applicants who are offered a contract of employment will, on their entry into service, retain their current grade and step. 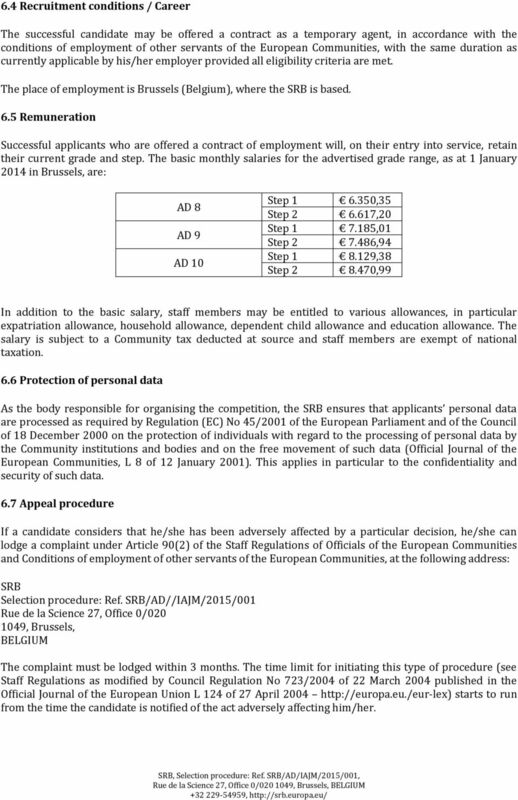 The basic monthly salaries for the advertised grade range, as at 1 January 2014 in Brussels, are: AD 8 AD 9 AD 10 Step ,35 Step ,20 Step ,01 Step ,94 Step ,38 Step ,99 In addition to the basic salary, staff members may be entitled to various allowances, in particular expatriation allowance, household allowance, dependent child allowance and education allowance. The salary is subject to a Community tax deducted at source and staff members are exempt of national taxation. 6.6 Protection of personal data As the body responsible for organising the competition, the SRB ensures that applicants personal data are processed as required by Regulation (EC) No 45/2001 of the European Parliament and of the Council of 18 December 2000 on the protection of individuals with regard to the processing of personal data by the Community institutions and bodies and on the free movement of such data (Official Journal of the European Communities, L 8 of 12 January 2001). This applies in particular to the confidentiality and security of such data. 6.7 Appeal procedure If a candidate considers that he/she has been adversely affected by a particular decision, he/she can lodge a complaint under Article 90(2) of the Staff Regulations of Officials of the European Communities and Conditions of employment of other servants of the European Communities, at the following address: SRB Selection procedure: Ref. SRB/AD//IAJM/2015/001 Rue de la Science 27, Office 0/ , Brussels, BELGIUM The complaint must be lodged within 3 months. The time limit for initiating this type of procedure (see Staff Regulations as modified by Council Regulation No 723/2004 of 22 March 2004 published in the Official Journal of the European Union L 124 of 27 April starts to run from the time the candidate is notified of the act adversely affecting him/her.